Footwear etc. 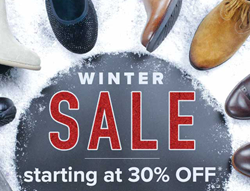 Announces Its Annual Winter Sale Including UGG and Vionic Markdowns. California-based comfort shoe retailer, Footwear etc. is pleased to announce that it has marked down prices on a wide variety of shoes and boots in stores as well as online. Customers can expect to receive savings starting at 30% on many popular brands such as UGG and Vionic. We are thrilled to some of the best collections from top brands in the industry, and now offered at incredible markdowns. Footwear etc. is pleased to announce that it has slashed prices starting at 30% on many of its shoes and boots in stores as well as online. This annual sale has proven to be extremely popular each year, and customers can find fabulous deals across many brands such as UGG and Vionic. This annual Winter Sale is incredibly popular each year, and customers can expect to find great deals on models from virtually all brands that Footwear etc. carries. There are specials both online as well as in the stores. Athletic footwear from Brooks, Hoka One One, Vionic, New Balance, and Merrell (just to name a few). These brands create the ideal experience for walking, trail jogging and track running. Outstanding support and comfort combined with fashion-forward styles are what make these brands so popular among customers. Men’s and women’s shoes from MBT, the original rocker shoe. These rocker sole shoes have built a loyal following by consistently providing wearers with a fit and experience like no other. Sandals and casual shoes from a variety of brands such as Born, Vionic, Kork Ease , and Pikolinos. Outstanding comfort and support, and on-trend fashion are now one in the same. All Winter Sale shoes, boots, slippers, sandals and more are available in Footwear etc. stores and online at http://www.footwearetc.com.